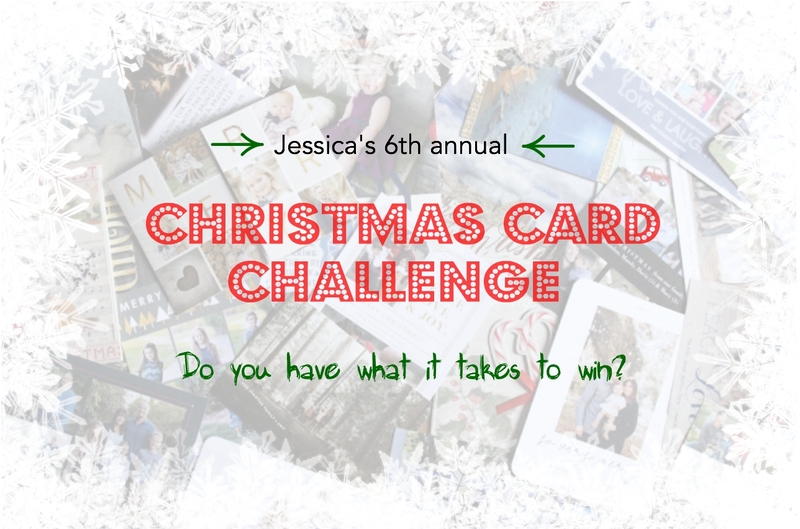 Having already received our first Christmas card in the mail, I thought now was a good time to announce the 6th annual Christmas card challenge. Thanksgiving snuck up on a lot of us last year and is early again this year, so I thought the early reminder to get a card made (and capitalize on those Black Friday card deals!) would be good for all. This contest was born out of my love of Christmas cards. Well, not just Christmas cards, but any holiday card. We've even gotten some New Year's cards, which I think is fun because it makes the card season last even longer! I get so excited in this season to check my mail every day. I love seeing smiling faces of those I love on cards, I love the handwritten notes, I love the updates, I love the lush beautiful cards, I love the funny ones. I just love it all. The first card to arrive spot has already been snagged by someone who was obviously on top of their game. And being on top of their game helped me, as it reminded me to get to work on my own card. If you want to join in the fun, but don't have my address, feel free to email me at jgrimbleby(at)gmail.com and I will provide an address to send it. And you need not be shy, I have had many people participate in the card challenge that aren't my close pals. And, guess what? Some have won categories! And, each one of their cards put a smile on my face because I LOVE CARDS. If you are looking for some inspiration, here are the winners in years past - 2017, 2016, 2015, 2014 and 2013. Just a little tip, funny cards are totally my jam, as are anything that makes your card stick out from the crowd. That could be a different shape, a different colored envelope, or perhaps forgetting to change your last name on your card, so it says the wrong name! Now get to work on your cards! Remember, Black Friday and cyber Monday are always great times to score great deals on cards and is normally the time I order them every year. And, what's nice is you can have them all designed and ready to go ahead of time and just purchase them when the good deal comes around. I'm excited for my mailbox to start filling with cards!